Landon Flake waited to make a left turn from a local coffee shop's parking lot onto a busy street. A person was walking down a sidewalk. Seeing him, the 17-year-old Flake slowly backed his car up a few feet to allow the person space to safely cross in front of him. "There has to be one hundred percent acceptance of yourself," Flake had said a few minutes earlier. A junior, athlete, and honor student at Steilacoom High School, he is a military dependent of an Air Force officer. "You have to be kind to yourself in order to be kind to others." His actions in leaving the parking lot exemplified what he modeled and learned at the recent, week-long spring 2019 Frances Hesselbein Student Leadership Program (FHLP) recently held at the Air Force Academy in Colorado Springs, Colorado. The FHLP was established by the Military Child Education Coalition (MCEC) in 2006 to identify exemplary young people through their participation in the MCEC's Student 2 Student (S2S) program. MCEC is a nonprofit organization which exists to help military children thrive in the face of transition and separation. To further enable children to succeed in today's educational system, MCEC created the S2S program to bring military and civilian kids together in welcoming all new students. S2S is premised on five core values: leadership, academics, service, finding the way and relationships. The program is found in some elementary, middle and high schools. The Steilacoom Historical School District is home to one of about 200 S2S programs globally. "S2S makes sure new students are one hundred percent accepted," continued Flake. "The job is to make the transition for new students as easy and as light as possible on the school side of things." Unsure where he will attend college or what to major in, Flake's participation in the FHLP will help considerably when he does apply. 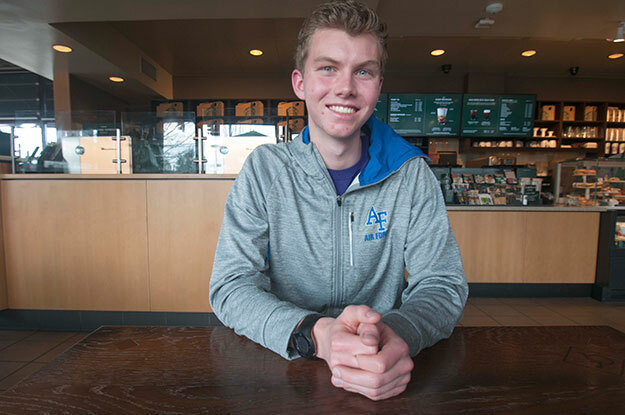 "I'm thinking about Brigham Young University and, maybe, the Air Force Academy," he commented. To attend the FHLP, Flake had to compete in a nationwide selection process from which only 10 students were selected. "I filled out the application; I attached my resumé; and I demonstrated that I am one hundred percent committed to the idea of acceptance," he continued. "I also had to choose and write an essay about a leader who inspires me, and I chose George Washington." During his week at the Air Force Academy, Flake talked with influential leaders, shared ideas and challenges about his local S2S program, and participated in team-building activities led by Academy cadets. After the course, attendees are expected to take their newly acquired skills and use them to improve their own S2S programs. "I will continue to promote the value of accepting yourself in order to be kind to others," he concluded. That is exactly what he demonstrated last Saturday afternoon in leaving the parking lot of a coffee shop.